Looking Beyond Behavior is a specialized training program for child care centers and family child care homes with the emphasis on the crucial relationship between the socio-emotional and the cognitive development of young children. 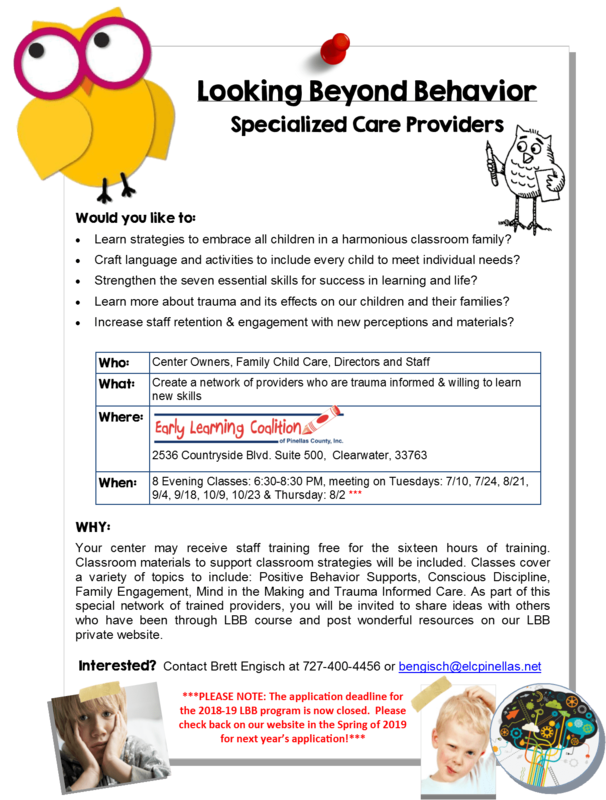 This training series focuses on trauma-informed care and the importance of nurturing relationships to enable teachers to respond to aggressive behaviors using a multitude of techniques to include: Positive Behavior Supports and Conscious Discipline. Materials will be provided at each class to support the implementation of the new strategies. We know that cognitive learning cannot occur without the social-emotional foundation of self-control, focus and emotional security. Come learn strategies to form a harmonious school family that fosters learning and connection on a daily basis.